Blackhawks fans sent a nasty message to Mayor Rahm Emanuel during the Stanley Cup victory rally at Soldier Field Thursday. When the team's president and CEO, John McDonough, thanked "the great mayor of the city of Chicago" for putting on the production, fans in the audience booed loudly in response. Emanuel, who was standing behind McDonough, appeared unfazed by the booing and laughed it off with Blackhawks announcer Pat Foley and the team's owner, Rocky Wirtz. Fans expressed their disappointment when the city announced it would host the rally at Soldier Field instead of Grant Park, where it was held in 2013, due to rain earlier in the week. More than 2 million people attended the rally in 2013, but Soldier Field could only house around 60,000 people. 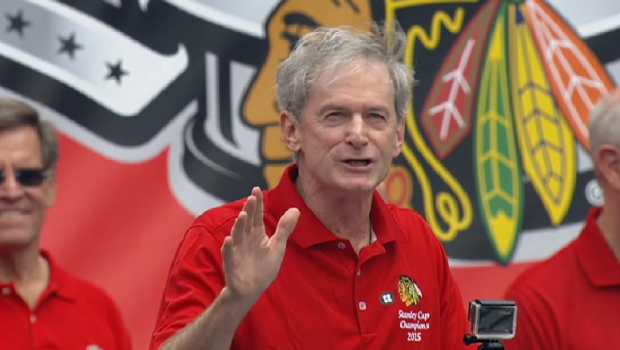 Pat Foley, the announcer for the Blackhawks, apologized at the rally for moving it to Soldier Field instead of Grant Park and limiting attendance. Free tickets were available to fans on Ticketmaster, but they sold out in less than 30 minutes. Some fans reported waiting up to 45 minutes on the site only to be denied when they arrived on the page to reserve their tickets. Emanuel did not speak at the rally, but he did stand on the stage behind all the players and team officials. Gov. 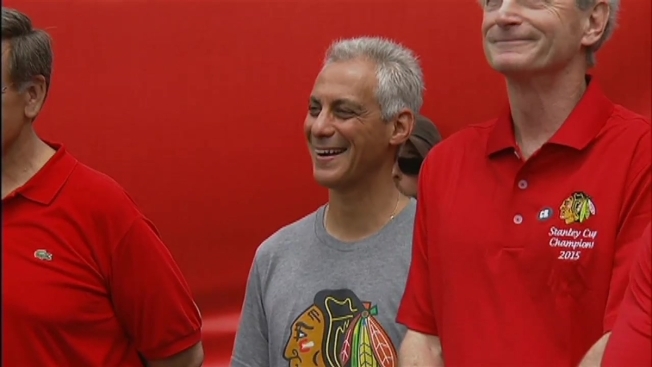 Bruce Rauner also attended the parade and rally, wearing a black Toews jersey. Like Emanuel, however, the governor did not speak at the rally and was barely seen at the celebration.